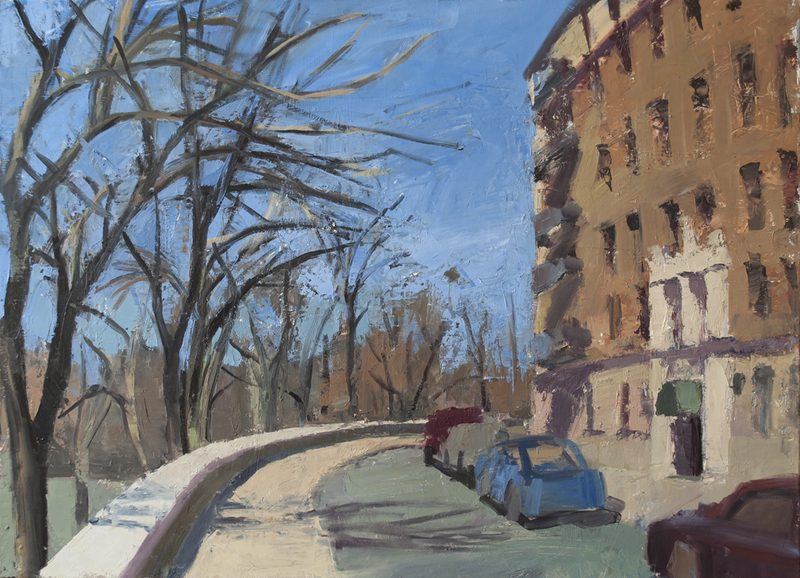 RSD, Early Spring, 2016, oil on linen, 22" x 30"
Working from observation, Tony Serio turns his focus to the urban landscape and Hudson River in Northern Manhattan. Using palette knife and brushes, he explores the terrain and architecture with a richly built up paint surface full of light and atmospheric color observed in the moment. Serio studied at Yale School of Art and Maryland Institute College of Art. Solo shows at the Bowery Gallery and other New York venues. Group shows include: Alpha Gallery, Boston, MA; The Drawing Center, NY; The Babcock Gallery, NY and The Hopper House, Nyack, NY. Awards include: Alice B. Kimball Grant for traveling in Italy, Yale University; Drawing Center Show Award and NoMAA (Northern Manhattan Arts Association) Grants in 2008 and 2011 to paint a series of Hudson River Greenway landscapes. Collections include Donald and Allison Innes, Columbia University and various other private collectors.